The Healthiest Brownie Recipe You’ll Ever Try! Some of you may know that Phil and I decided to go gluten-free a while ago. For me, the hardest part is the baked goods and most of the gluten free baked goods really aren’t much better for you so we try to avoid bread and other foods with flour as much as possible. A few weeks ago my wonderful step-mom made the most amazing brownies that, as far as brownies go, are healthy! You’ve got to try these…. even my kids had no idea that the main ingredient is black beans! Preheat oven to 350. Grease a nonstick 9×9 inch square baking pan with baking spray and line with parchment paper, leaving a 2 inch overhang on all sides. Blend the black beans, eggs, cocoa powder, sugar, oil, milk, balsamic vinegar, baking soda, baking powder and coffee in the blender until smooth and pour into a bowl. Fold in 1/2 cup chocolate chips until combined. Pour the brownie batter into the prepared pan. Sprinkle the remaining chocolate chips evenly over the top of the brownies. Bake the brownies until a toothpick comes out clean, about 30 to 32 minutes. 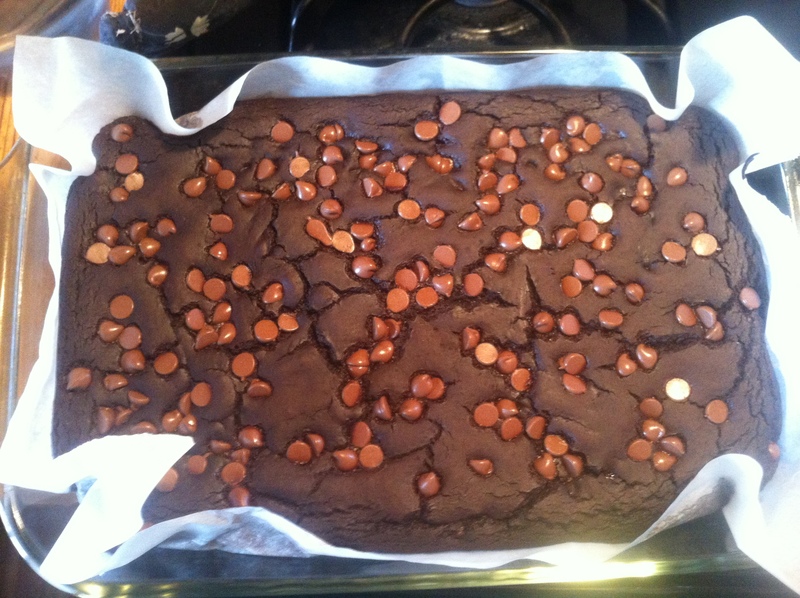 Allow the brownies to cool completely before slicing them into squares. ← Now we are 7!